Time flies when you take on so many learnings and start transforming your business model. 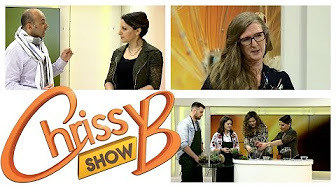 Today as I decided it was time to share the amazing experience I had with the wonderful Chrissy on the Chrissy B Show I was a little thrown to discover it is over a month since we filmed the episode! I have been ruminating on the journey that led me to be invited to appear. Chrissy & I met for the first time during the festive season of 2016 at a celebratory breakfast with the Global Woman’s Club. We started chatting over croissants and tea. I was curious who Chrissy is and what matters in her life. 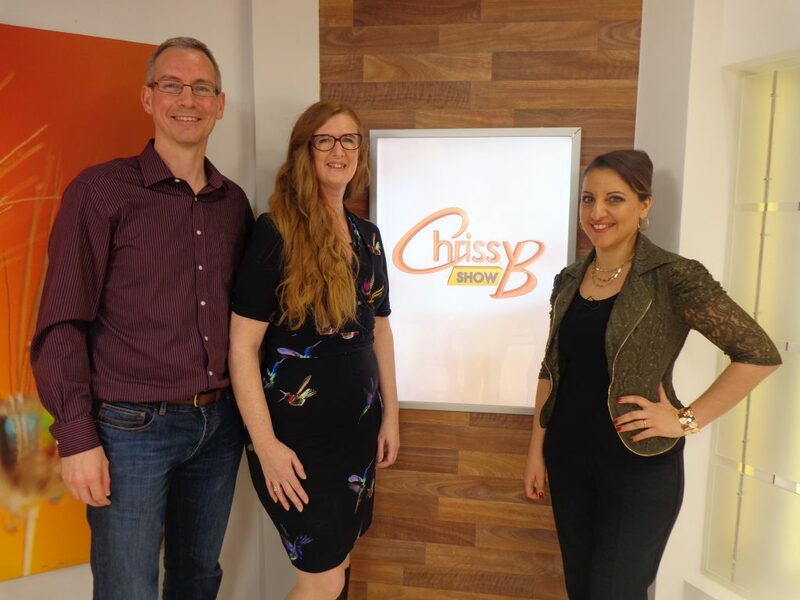 She shared a little of her own story which led to the Chrissy B Show, the only TV show in Europe that focuses on mental health & well-being. We talked about the importance of mental health as people embrace their whole-being. And as the focus of the conversation turned to me and what matters in my world we began discussing Hummingbirds – that we are the people who are driven by our curiosity to pursue ever-changing and varied interests and how many of us at various points in our lives appear to have struggled with our own mental health – including depression and anxiety. 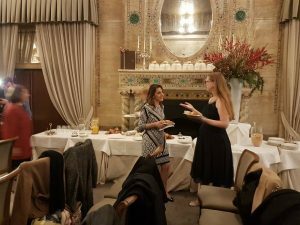 We agreed that the more people learn to be true to themselves and how to be their own self within the world the less likely we are to succumb to serious mental health challenges. 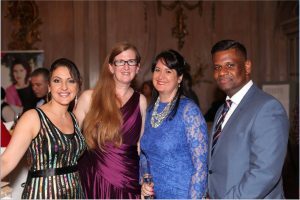 Fast forward 3 months where Chrissy & I meet for the second time at the Global Woman’s Award Gala Dinner. A glittery night where I spent time catching up with her, meeting Michael (her husband) and resonating together over the challenges we both have had as introverts at times in making ourselves attend and fully participate in large group activities. I cheered loudly as Chrissy accepted her award where public acclaim had declared hers the best cover story of the year! Chrissy and I connected on social media, emails were exchanged and she extended the invitation to me to be a guest on her show. She offered me the opportunity to be the weekly ‘makeover guest’. As make up is something I rarely play with I was up for a different experience. I said yes … thinking we would schedule some months ahead. But ‘no’ … within 2 weeks Gareth & I were knocking on the studio door at the appointed time. I’d invited Gareth to join me for two reasons. Firstly, he loves the whole concept of TV (he’s been on a quiz show and been within various programme audiences) and I knew he would be fascinated to observe how Chrissy and her team put together the episode. Secondly, I wanted the moral support. I was nervous. How was I going to come across? Would what I have to say resonate? Would I be heard? And what would I look like through the makeover process? From the moment we arrived Chrissy and her team were fabulous. We were taken into the ‘green room’ which was cream. Another couple were already there and we discovered that they were going to be demonstrating how to make a terranium. As Hummingbirds Gareth and I were both instantly curious. And then I was led off to begin the make over process. Chrissy came to welcome me and take a photo of me ‘before’ … a lovely close up moment that was. The make-up artist working with me, Sanni Sorma, instantly began putting me at my ease. We discussed my daily make-up routine (that was a short conversation) and a decision was made about the approach we were going to take for my appearance on the show. Sanni told me what she was doing and otherwise we discussed me and Hummingbirds. Sanni had an ‘aha’ moment as she recognised herself as one too. When we were done Sanni led me through to the studio itself. As we quietly entered through the door I discovered Gareth happily sitting on a couch at the back of the room watching the goings on. Chrissy and her colleague were learning about making the terraniums. It looked like a lot of fun and is definitely now on my list! Sanni and I were invited to come up and talk about the make over experience. This was it … my first moments on camera … nervous? Watch my hands during this segment (from 2’59-3’55) and that’ll give you the answer. Chrissy is incredibly approachable. Her friendly real connection builds rapport quickly. That helped me relax as I answered her questions about my make over experience. 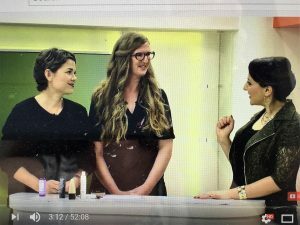 I sat back down with Gareth to watch the segments on make up and hair care tips being filmed. The team worked well together. Chrissy and Sanni have a good relationship and there was humour throughout. The studio was rearranged and it was time for me to sit with Chrissy and be interviewed about Hummingbirds and the services we are offering. Chrissy and I ended up going slightly off piste, which led to a fascinating conversation. And at the end she declared that she too is a Hummingbird! I cheer every time I meet someone who has the diverse iridescence to impact our world in sustainable positive ways – and in this unique team I’d now met two! Chrissy and I could have spoken for hours about being successful Hummingbirds – however the format allows for finite interview segments. We kept it succinct (from 29’33 – 36’27). I’m curious to know what resonated for you in what we discussed?